According to the 2010 United States Census there are 2.1 million Americans who are 90 years old or older. I don’t know how many of these nonagenarians and centenarians are locals, but we know some of them, and we will be celebrating them at our next potluck meeting, Tuesday, October 25. I hope you will attend and bring along a dish of your favorite casserole, meat, salad, vegetables or dessert to share. As usual, the 6 PM meeting will be in the upstairs Community Clubhouse. Remember to bring a guest or two. We will have announcement of candidates and election of next year’s officers. If you are interested in assuming any post within the Society, please contact Trude Vasquez, Chair of the Nominating Committee. Nominations may also be made from the floor. We have some exciting projects underway and we need the help of our members to bring them to fruition. Most imminent is our Friday, November 4 Soup Night fundraiser. Preparations are moving along nicely and, happily for those who have them, seats are sold out. If you are not yet helping, but wish to contribute your time or raffle/auction items, contact Claudia Thorn to volunteer. Proceeds from our fundraising will help the Society create the new History Gallery at 10340 Fair Oaks Boulevard. 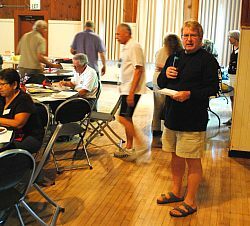 Committees are at work preparing the building and planning the first of what we hope will be many rotating exhibits on aspects of Fair Oaks history. The first exhibit is planned to focus on water and its importance to the development of our community. The Gallery also will feature a permanent exhibit on the overall history of Fair Oaks. The History Museum in the Fireside Room will continue to provide display of documents, photos and artifacts of Fair Oaks history. A committee is also at work to prepare the History Gallery building for public use— making it accessible, secure and attractive. If you’d like to be involved in any aspect of the History Gallery or its exhibits, we welcome your participation. Volunteers will also be needed to tend our facilities during open hours. Have a great autumn, and see you at the potluck on the 25th. 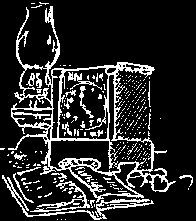 In the meantime, check out the Society’s website for new and interesting items. We've been derelict in reminding our members when their membership renewal is due. We should have had the reminder in the July newsletter. So, we'll be printing the "last paid" field from our membership database at the bottom of our mailing labels. Please be sure to check the label, and if the date is before July, 2011, please renew your membership using the form on the back of the newsletter, or drop off your cash or check at the October General Membership Meeting. If you get the newsletter via e-mail, you'll get a special message with your newsletter. If our database is wrong, please let us know and we'll correct it. We do occasionally make a mistake. On another subject, no, you're not missing a page in this newsletter. We gave our Old Homes Editor this issue off. We'll resume that section in January. Trude Vasquez introduced Mark Davidson our speaker for the evening. 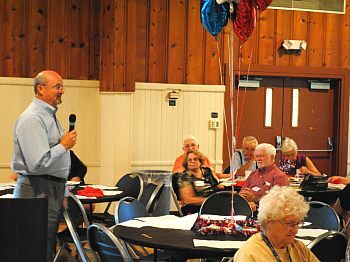 Mark spoke about the Rancho San Juan Land Grant and other local land grants, and the impact of the Gold Rush on our area. The program for the October Fair Oaks Historical Society will be a group birthday party to honor the long-time residents of Fair Oaks who are 90 or older (maybe even some not quite 90). These are the people who made Fair Oaks what it is today and can tell us how it used to be. Each of the birthday guests will be introduced and a few special memories will be shared. So come to the party to celebrate our precious 90 plussers. You can e-mail Maria Brugger to make sure her list of names is complete. (bruggermaria@yahoo.com). Friday, November 4th is rapidly approaching and I'm happy to announce we are 'Sold Out' again. We do need volunteers to help set-up, clean-up as well as work at the event. Eleanor Brown has graciously agreed to coordinate the volunteer committee. If you wish to volunteer, please contact Eleanor at 967-6528. Trude Vasquez is looking for donations for the raffle and silent auction. Please contact her at 966-5499 if you have a donation. We're looking for gift certificates, gift baskets, bottles of wine, vacation rentals and other donations from our local businesses. Speaking of wine, we are looking for members who would donate a case of wine to be served at the event. Dianda's, who usually donates 2 cases of wine, is not able to make it's generous donation this year. So... is there a member who would be willing to donate a case of red or white wine? Please call me at 961-8291 if you're able to help out in any way. Looking forward to seeing you all at the next Quarterly Potluck on October 25th. The History Center was open on September 17 for the Chicken Festival celebration. Seventy people signed our guest book. Many more also enjoyed the exhibits. The annual Christmas open house will be on December 11 on our regular 2nd Sunday from l:00 to 4:00. No refreshments will be served this year. Jim Pearce will be on hand to record any "historical moments" anyone has to share. Come and tell your story. The following people have been docents this year. Fran Sargent, Lois Frazier, Larry & Meg Smart, Cheryl Welch, Ralph Carhart, Merina West, Janet & Warren McWilliams, Mickey Showers, Dorothy Elliott, Jim Pearce, Bette Benedetti, Ken & Lynn Steen, Judy & Warren Blomquest. Thank You!!! We continue to work toward rehabilitating our History Gallery. We have developed a plan for the area in front of the building, and are working toward getting ADA parking put in. Our President is working to develop a concept for the interior of the Gallery. Our next big efforts will be to improve the front room. We had our first event at the Gallery. 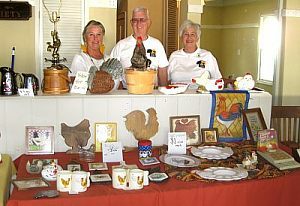 Marilyn Pearce led a group that hosted a successful memorabilia chicken sale during the Chicken Festival. They raised money and because many people stopped in it raised the publics knowledge of our Gallery. We are looking for 12 volunteers to work for one month each to visit the building once a week to clean up the front and check on the landscaping. Thanks go to Helen Cadloni, a local who moved closer to her family in Oregon. She donated 8 boxes of "chicken items" which she had collected in 1988. They were the foundation for the F.O. 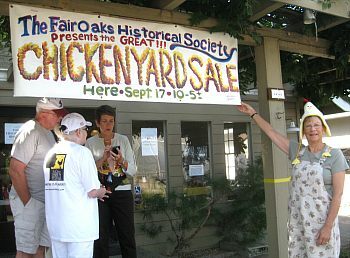 Historical Society's Chicken Yard Sale at the Chicken Festival, Sept. 17, in the old Buddie's store. It netted $230.00 toward improvements to what will become the F.O. History Gallery. Helpers included Lois Frazier, Janet and Warren McWilliams, Nancy White, Cheri Fuller and appraising by Mary Scott. Thank you also to our members who donated items to this event! President Ralph Carhart called the meeting to order and welcomed new members and guests. Membership Chairman Tel Labelle announced that we have 180 memberships but approximately 240 members when you count the individuals. A large number have not paid their dues. Lynn Steen reported on Soup Night to be held November 4th. Tickets are now on sale, a sellout is expected. New this year are tables of nine. The price to purchase a table is $225.00. All seats will be reserved. All tickets will be sold through the Soup Night Committee. Members who don’t wish to attend the event but would like to help may sign up for the Cleanup Crew. They will be asked arrive at 7:30. Please get raffle items to Trude Vasquez soon. We are soliciting donations of Spoon $100.00, Bowl $200.00 and Kettle $300.00. Ralph Carhart announced that 6th Annual Chicken Festival will be held Saturday, September 17th,10am to 6pm. The History Center will be open. Ralph also spoke about the Park District Master Plan for the Plaza/Village Park, the Clubhouse and the Veterans Memorial Amphitheater which are under consideration. Our organization should be involved and offer input. Ralph reported that Arcadia Press has a new release out on Citrus Heights. Don Rose made a motion to accept the minutes of the April 26th meeting, Jim Pearce seconded and they were approved. Treasure Joe Dobrowolski had nothing additional to report. New officers will be elected at the next general meeting on October 25th. A nominating committee was approved: Trude Vasquez, Chairwomen, Lynn Steen and Lois Frazier, members. Joe Dobrowolski, so moved and Ken Steen seconded. Ralph reported on progress at our “History Gallery”. Joe’s team has working on the security system and plantings for example. The second phase will include development of exhibits and deciding on the story that we would like to tell, from the Colony to suburbia. Also we will be starting round table discussions. Lois Frazier reported that we received a Certificate of Appreciation from the Cemetery District for our participation on Memorial Day. Lois needs extra docents for August 12th when the children’s Theater Group will be using our Museum as a staging area for their performance. The Fair Oaks Chicken Festival will be held on October 17th. Marilyn Pearce will be selling chicken-related items. If you have chicken themed items to donate contact Marilyn.